Coca Cola is a giant multinational that has always realized brilliant marketing strategies. This time, in Hong Kong we spotted the American company’s promo campaign ‘Taste the feeling’ for the Chinese public. This years the carbonated soft drink producer decided to launch this heavy marketing campaign to reunite its sub-brands Red coke, Life, Zero and Diet coke, under one same brand. Here is what we found. It is basically a purchase with purchase. With the purchase of two bottles of Coke Zero or Red Coke, you can add $3 to get a special Coke-bottle-magnet to “share your feelings”. 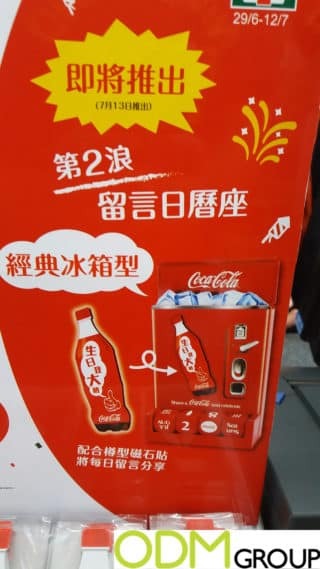 Coming soon, also the extra promo that will give you the chance to obtain the Coke’s costumed message-calendar in the shape of a refrigerator. The magnets are purposely costumed in order to let clients share their feelings through this Coke’s bottles. 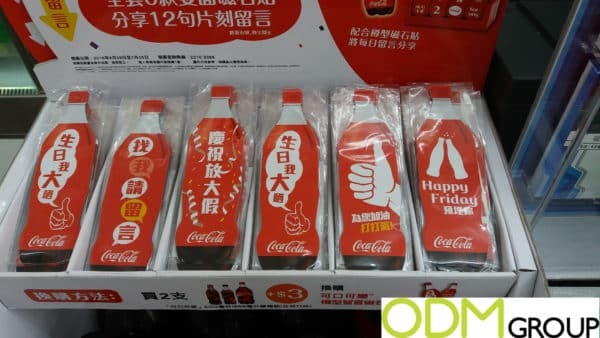 What makes it a great promo product is the easy recognisability: classical shape of Coca Cola’s bottle and distinctive red and brown colours, plus oriented quotes. 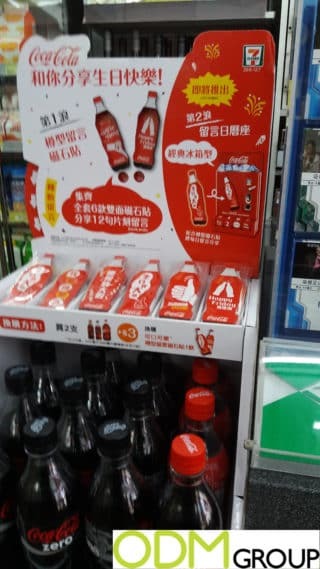 Moreover, note that they are magnets and complentary products to the Coca Cola themed calendar. This raises their value. We find expressions such as: ‘At my birthday, I am the greatest’, ‘leave a message if you are looking for me’, ‘Finally holidays’, ‘Fighting!’, ‘Happy Friday! Come to celebrate!’, ‘Selfie time!’ and so on. Hence, plenty of excuses to take a selfie or stick them on any metal-made surface. What will Coca Cola gain from such an in-store campaign? Marketing: the idea behind the promo campaign is, drink a Coke and share your feelings. As we previously saw, the magnets are made deliberately to be social and to be shared. Instead of writing a boring post on Facebook, you post a photo with your new super cool purchase. All your friends are going to like, share and comment, which means marketing for Coca Cola. Increased perceived value: such a promo campaign does not stops to the in-store but it literally goes social. Coke was able to analyse the market and capture the latest trends. Young people especially, will perceive the brand closer to them and therefore there will be a higher perceived value. Brand awareness: Everyone knows Coca Cola, but not as many people also know about it sub-brands Life, Zero and Diet. This purchase combination will push customers to try or at least be curious about them. Here at the ODM Group we have significant experience of sourcing, designing and manufacturing. Therefore we can offer you our assistance for your next promo campaign, contact us today and we will choose the best promo for your business.